Erythrocytosis is defined as an increase in red blood cell (RBC) mass, usually absolute, and is also associated with an increased hematocrit (HCT) and hemoglobin concentration. Although some use the term polycythemia interchangeably with erythrocytosis, the two are not synonymous. Polycythemia in precise terms refers to an increased number of any hematopoietic cell in blood, be it RBCs, platelets or leukocytes. An increase in RBC number (whether relative to changes in body water or an absolute increase in RBC mass) is more precisely called erythrocythemia, but this term is not in general use and we are currently using the term erythrocytosis instead of polycythemia for an increase in RBCs (relative or absolute). Complicating matters is the term polycythemia vera, which specifically refers to a type of chronic myeloid leukemia that only affects the erythroid lineage or, in other words, a chronic erythroid leukemia. An increased HCT or RBC count can be relative (proportional changes of RBC numbers in relation to plasma water) or absolute (a true increase in RBC numbers due to erythropoiesis, i.e. erythrocytosis). The different causes of an increased HCT or RBC count can be distinguished on the basis of clinical signs and signalment (dehydration, young horse), response to fluid therapy (relative increases should correct with appropriate fluid treatment), total protein concentration (usually only increased with relative increases due to dehydration), detection of hypoxia (arterial blood gas analysis), cardiovascular and pulmonary evaluation, and searching for underlying causes of increased RBC production, which would result in a true increase in RBC mass or erythrocytosis (such as liver and renal disease, including neoplasia). Measurement of erythropoietin concentrations are rarely performed and usually not informative (i.e. not helpful in distinguishing between causes). Bone marrow aspiration is usually not worthwhile as the marrow shows an erythroid hyperplasia in all causes of erythrocytosis. Loss of intravascular water (hemoconcentration): Causes are dehydration and increased vascular permeability (secondary to endotoxemia). The total protein, with both albumin and globulin, concentrations will usually be increased due to water losses in excess of RBCs (albumin is a more specific indicator of hemoconcentration than globulins because the latter will go up with inflammation or antigenic stimulation). With moderate to marked external losses of water, the animal usually displays clinical signs and laboratory features of dehydration (increased total protein and albumin concentrations, perhaps increased sodium and chloride concentrations). With internal losses, there may be evidence of fluid accumulation in internal sites (e.g. peritonitis, sequestration of fluid in a non-functioning or blocked gastrointestinal tract) or of endotoxemia (inflammatory leukogram, thrombocytopenia). With endotoxemia, the alterations in HCT are usually mild and the animal does not show clinical signs of dehydration (unless there is concurrent fluid losses or sequestration), although they may show signs of endotoxic shock. Splenic contraction: Up to 30% of RBCs can be stored in the spleen and these RBCs can be released upon splenic contraction. Contraction occurs during extreme excitement or fear and is likely epinephrine-mediated (Deniau et al 2013). This is usually seen in young horses (usually hot-blooded breeds, such as Arabians, Thoroughbreds, Appaloosas and Standardbreds), since horses have a muscular spleen, and is less likely in cows, dogs and cats. Splenic contraction is associated with a relative increase in RBCs in relation to water but, unlike hemoconcentration, will not be associated with an increase in total protein concentrations. Splenic contraction and a component of hemoconcentration may also explain the increase in HCT seen in horses subjected to strenuous exercise (Rose et al 1983, Snow et al 1983). Absolute increase in HCT or RBC mass (erythrocytosis): This is due to increased erythropoiesis and can be primary (a bone marrow disorder) or secondary, due to appropriate or inappropriate production of the erythropoietic cytokine, erythropoietin. Primary erythrocytosis: This can be a familial disorder or neoplastic. Familial erythrocytosis has been reported in Jersey cattle (Tennant et al 1967). A congenital condition could have been the cause of a persistently increased HCT in a 2 year old Arabian gelding (McFarlane et al 1996). Polycythemia vera: This is a chronic myeloproliferative disorder (chronic erythroid leukemia) and is a neoplastic condition in which RBC production is autonomous and independent of erythropoietin concentrations. In human patients, this has been shown to be largely due to a mutation in Janus-activated kinase 2 (JAK2). JAK2 is a non-receptor tyrosine kinase that is downstream of the erythropoietin receptor and directs the signaling cascade triggered by erythropoietin binding to its receptor on RBC precursors in the bone marrow. The signaling then drives cell division and erythropoiesis. Normally, JAK2 is only activated (by phosphorylation of tyrosine residues) when erythropoietin binds to its receptor. However, up to 90% of patients with polycythemia vera have a homozygous single amino acid mutation in JAK2 (valine is substituted for a phenylalanine in amino acid 617), which makes the enzyme constitutively active. This drives erythropoiesis, either independently of erythropoietin or because RBC precursors become hypersensitive to normal concentrations of erythropoietin. Polycythemia vera is rarely reported in animals and a genetic mutation in JAK2 has not been identified in affected animals. Polycythemia vera is usually a diagnosis of elimination, ruling out other causes of secondary erythrocytosis or a relative increase in HCT. Secondary erythrocytosis: This is usually due to increased erythropoietin production. The physiologic stimulus for erythropoietin production is hypoxia, therefore erythropoietin production can be appropriate (in response to hypoxia), albeit excessive, or inappropriate (independent of hypoxia). Appropriate secondary erythrocytosis: There is an appropriate stimulus for erythropoietin production, which is principally hypoxia, e.g. cardiovascular or respiratory disease, increased affinity of hemoglobin (carbon monoxide poisoning). Inappropriate secondary erythrocytosis: This is due to enhanced erythropoiesis that is independent of a hypoxic stimulus, and is usually mediated via erythropoietin. This has been reported with erythropoietin-producing neoplasms (hepatocellular carcinoma, hepatoblastoma in horses, renal cancers, nasal tumors in horses) or renal disease (hydronephrosis, renal cysts), which for some reason stimulate erythropoietin production without hypoxia. 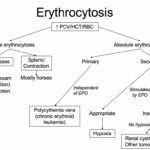 For most of these tumors, increased erythropoietin production makes sense because erythropoietin can be produced in the kidney (main site) or liver. However, tumors can ectopically secrete cytokines, which may explain erythropoietin production in tumors in unexpected sites (e.g. nasal tumor). Epinephrine-producing neoplasms, such as pheochromocytoma, can also result in a fluid-unresponsive erythrocytosis (but this may not be a true increase in RBC mass). Similarly, mild increases in RBC numbers can be seen in some dogs and cats with endocrine disorders, such as dogs with hyperadrenocorticism or excess androgens and cats with hyperthyroidism and acromegaly. This may be mediated through erythropoietin.